Located 60 miles to the south of Casablanca, on the Atlantic coast, Mazagan Beach & Golf Resort is in the heart of a region which is still off the tourist track: the Doukkala. This beautiful hotel is a genuine oasis, featuring luxurious facilities, elegant surroundings and a superb golf course. We found 11 offers matching your search. 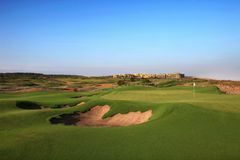 The Mazagan Golf Club was designed by Gary Player, the South African who won nine Major championships and who is considered one of the greatest players the game has ever seen. Some of his most important victories were on links courses, and this style of course was a major source of inspiration for him when designing the course at Mazagan. This par-72, 18-hole links sits right next to the beach and follows the contours of the dunes and natural features of the land. Player focused on respecting the environment, conserving its natural character and the wonderful sea views - and he did a wonderful job. Golfers of all levels of ability can enjoy this course, and while its challenging enough for good players, its broad fairways are very forgiving for the less proficient player. Conditioning is first class too, and the Mazagan course is run by Troon Golf, a company with a worldwide reputation for the quality of its service and maintenance. In the heart of a leafy oasis lies the luxury five star residence that is Mazagan Beach & Golf Resort. The main hotel is a sight to behold, with its ochre walls and green tiled roofs, bordered by a stunning swimming pool and surrounded by date palms. Covering four floors, its 500 rooms and suites offer spectacular views over the Atlantic Ocean, the lagoons, the golf course, as well as the patio, swimming pool and luxurious gardens. Deluxe rooms are spacious and offer a wonderful view of the ocean or the landscaped grounds. The distant breaking of the waves or the soft breeze of the palm trees adds to the exotic atmosphere. This superb resort has a casino, Spa, nightclub and eight restaurants. Inspired by the Arabs and the Moors, the décor is heavily influenced by Moroccan art and local crafts. The furniture is made out of dark wood that is common to this area, and the prevailing Arabic-Moorish style can also be found in the elegant bathrooms, which feature a bathroom, a roomy shower and hairdrier. Standard rooms come with satellite television, Internet and Wi-Fi connection, safe, mini bar and air-conditioning. Excellent resort .very friendly staff and great food. For a number of years we have been trying to find an all-inclusive golf resort/holiday that would provide the 5 star quality and facilities that Fairplay hotel in Benalup provided before its demise. On recommendations we tried Turkey last year and we were disappointed. The Magazan Resort in Morocco however, scores extremely highly on our scale of quality, service and facilities. The hotel itself was fantastic. Very clean, impressive décor, a wonderful pool, excellent rooms and even our “partial sea view” was very good. There’s a great gym and spa and good tennis courts too. There are also great facilities for kids if we ever take any! We went horse riding but this was disappointing (just a walk on the beach!) so wouldn’t recommend. Mazagan’s golf course is excellent; very interesting and challenging. We played 6 days and never tired of the course. In fact, it is a course I would be happy to be a member of and would never get bored. We had golfers in our group from handicap 12 – 36 and they all enjoyed the course too, coping with the challenges it threw at us. The course is long and the greens are excellent; fast, true and undulating. There are 4 levels of tee which will appeal to any golfer and from the backs, the course will challenge even the lowest handicappers. The golf club’s bar and restaurant are very good, in a great spot over-looking the sea, as well as the 9th and 18th holes. Highly recommended. In terms of food, there is a mix of buffet food and a la carte. We are very discerning diners and I must say I can’t wax lyrical enough about the buffets. I hate buffet slop that is over cooked and often left to go cold but this buffet was excellent. From the sushi to the curries and desserts, everything was prepared with fresh ingredients, was hot and of a very good quality and was always served with a smile by the chefs. My only view on how they could improve the food is to provide a wider range of menu for all-inclusive clients in the a la carte restaurants which is different from their normal menus. The range of beer, spirits and wine on offer is OK but could be wider too. This was a great holiday in a true 5 star resort and will definitely go back and recommend the resort, as well as Your Golf travel to my friends. The course is well laid out but punitive off the tees .would suit a low handicapper who can hit a long way off the tee.Greens are very fast with lots of undulations. Hard to read .